One of the challenges of working at a historical society is coming across objects that do not have clear provenance or purpose. This week’s Object Spotlight focuses on a gunny sack that is difficult to completely decipher. The reusable bag is made of tightly woven cotton or hemp fibers. Printed on one side of the sack is “A. F. Schiebe.” Schiebe is a common name in Plymouth history. 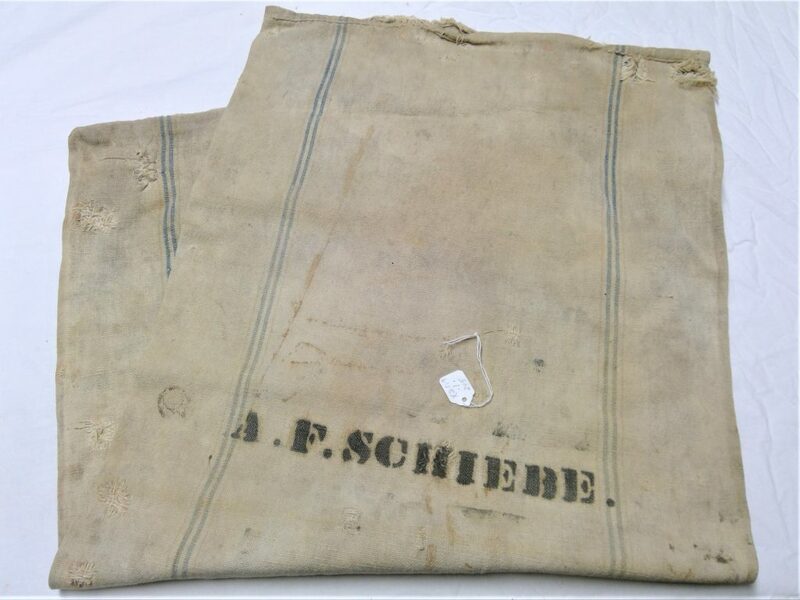 The likeliest original owner of the sack would be Albert Frank Schiebe [1883-1950]. A harder thing to determine is when the sack was used and how. On the other side of the sack, a large letter “A” is clearly visible along with the word, “Hennepin.” The rest is faded to the point of illegibility. There are many uses for sacks such as this. If used on a farm, it could have been used to transport ground corn or grain for feeding the animals. The ground grains would have most likely come from a local feed mill. Even today, small town farmers take reusable sacks to the local feed mill and load them up to feed their animals. These small feed mills are a reminder of a past that is slowly dying. If not used on the farm, it is also possible that the sack could have uses in the home carrying flour or potatoes. Either way, hauling these sacks around was no easy task; when full they could easily weigh 50 to 75 lbs. To learn more about the Schiebe family, please visit our Family Histories page.